“White House Warns Taliban: ‘We Will Defeat You,'” CNN, September 21, 2001 (http://archives.cnn.com/2001/WORLD/asiapcf/central/09/21/ret.afghan.taliban). 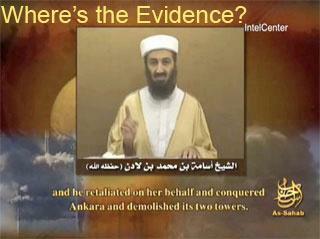 BBC News, “Tape ‘Proves Bin Laden’s Guilt,'” December 14, 2001 (http://news.bbc.co.uk/2/hi/south_asia/1708091.stm). “Osama Bin Laden: Dead or Alive?” Veterans Today, October 22, 2009 (http://www.veteranstoday.com/modules.php?name=News&file=article&sid=9079).